Weighty Matters: Kellogg's Froot Loops are soooo good for you! 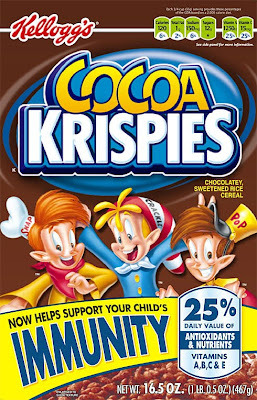 First there was their ridiculous "Now helps support your child's IMMUNITY" claim they plastered over their Cocoa Krispies and other sugary sundry (for which they may face charges in San Francisco). Now on television they've got children pretending to be doctors extolling the benefits of Froot Loops and Apple Jacks and their complement of 3gr of fibre. I can't do the stupidity and shamelessness of their commercial justice so I've included a video below (email subscribers you've got to visit the blog to watch).